Learn how to style layered long hair in this Howcast hair tutorial featuring celebrity hairstylist Jacqueline Bush. My name is Jacqueline Bush, and I am an editorial and celebrity hair stylist. My clientele has included Faith Hill, Mark Ruffalo, Terrence Howard, Gwyneth Paltrow, Jane Krakowski. I want to be able to show you that hair isn&apos;t as intimidating or as hard as you think it is, and I want you to be able to have fun with it and do what your vision is with your hair. So, now I&apos;m going to show you how to style layered, long hair. Now, there are two different ways you can do this. The first method is to use a brush and take it through, blow dry each section by section in different directions, and what I found is that for everyday use for the consumer, even on myself, this can be really difficult, because it takes a long time, and it&apos;s also very hard to get a lot of control over the hair. 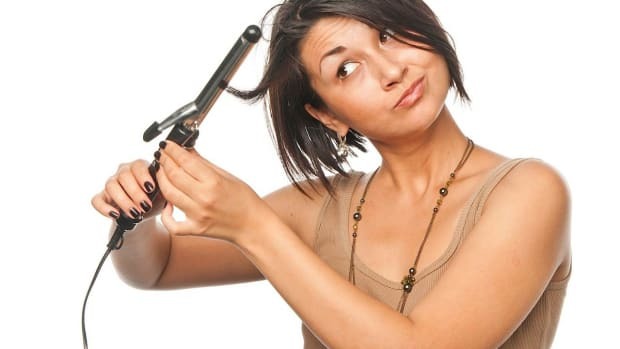 So, when you&apos;re in a hurry in the morning, the easier way to do it, which is what I&apos;m going to show you today, is using a curling iron. Now, the main curling iron I use is a one-inch barrel curling iron. The brand I love is called Hot Tools. This you can pick up at any local drug store. It&apos;s actually one of the best curling irons on the market, and it&apos;s really cheap. So, what I&apos;m going to do, starting at the bottom of Monica&apos;s hair, so I&apos;m going to take it through Monica&apos;s hair. She already has a little bit of heat protector on her hair so that her ends don&apos;t get too dry. I&apos;m going to silk it through one time, just very gently. As you notice, I didn&apos;t take it, clamp it, and keep it there, because, as the camera will show, you notice how, when I did that, it dented the hair. I&apos;m doing it a couple of times because I showed you guys the dent, so now I have to get the dent out of the hair. Now I&apos;m going to take her first little piece here, and I&apos;m just going to curl it, I&apos;m not going to spend a lot of time on it. Just very simply, just to give it a little bit of body. I&apos;m going to take her next section, and again, as you notice, I&apos;m not being too precise. One of the keys to getting that nice, natural-looking wave is not about a lot of precision, especially when you&apos;re in a hurry. It&apos;s also not about super-curling your ends. So, I&apos;m going to take the iron, again, I&apos;m going to silk it through. Now this time, I&apos;m going to go in the opposite direction. Now she&apos;s got one piece going forward towards her face, the other piece going away from her face. This time I&apos;m going to take the iron, and after I silk it through the hair, I&apos;m going to do something different. As you noticed before, I took the iron and I clamped down on it as I did my curl. This time, I&apos;m going to do something, just going to hold my iron vertical to the hair, and I&apos;m going to wrap the hair around it. Going to hold it there for a moment. And then I&apos;m going to let it fall. And as you see, it gave a little bit of something different than these two. So, I&apos;m going to go through the whole head, now, just doing section by section, not worrying too much about how thick my sections are. Some I might be curling ends in all different directions. That&apos;s the key. If you don&apos;t do it in different directions, you&apos;re not going to see your layers. Silking, then curling. So now, I have the curl in the hair. And what I&apos;m going to do, is I&apos;m going to take my fingers, I&apos;m going to use a little bit of pomade, just a small amount, a fingertip&apos;s-worth amount. This is a shine paste from, again Renee Peture. I&apos;m going to emulsify it in my hands so that it&apos;s evenly distributed through the tops of my fingers. If I&apos;m getting it down here, I probably am not going to be touching that part of the hair, so then you end up wasting product. So I&apos;ve rubbed it in my hands, gotten it nice and warm, and now what I&apos;m going to do is just break up that curl a little. And as you can see, now you see the different pieces of Monica&apos;s hair, you see the movement, whereas before it kind of grouped together as one whole piece. You can now see the different layers and all the texture in her hair. And that&apos;s how you style long, layered hair.